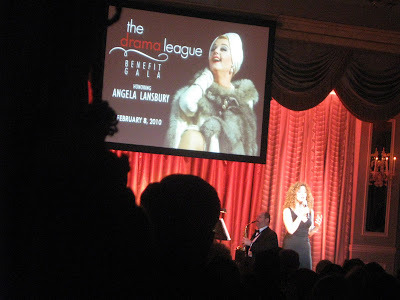 Last night, the Annual Drama League Gala was an evening billed as a Musical Celebration of Broadway honoring Angela Lansbury. I worked as one of dozens of volunteers - helping with the evening by stuffing gift bags, assisting with the silent auction set up, and finally acting as a "Greeter" in full party dress. 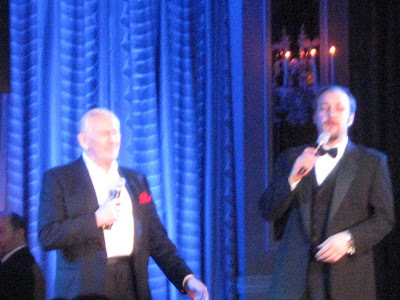 I arrived at the Pierre Hotel at noon and was privy to the rehearsal - first Len Cariou and Alexander Gemignani, then Cheyenne Jackson and Christopher Sieber working on Bosom Buddies and best of all, Donna Murphy in a fantastic rendition of Me & My Town (please, oh, please let her be the Mayoress in the upcoming Anyone Can Whistle at Encores!). At 5:00, we dolled up (we shared a green room with the stars, which meant that Bernadette and I were gathering our belongings together after the show) and prepared to greet guests. Hundreds of guests arrived in varying degrees of couture. 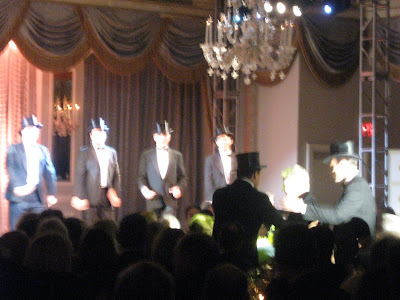 While I did see a few Broadway producers such as Stuart Lane, Jamie DeRoy and Marty Richards, the crowd seemed mostly comprised of socialites and patrons of the Drama League. My position did allow me to see Angela arriving like the Queen she is, in a beautiful full length velvet gown. My duty also included pointing some of the performers toward the right door for the green room. 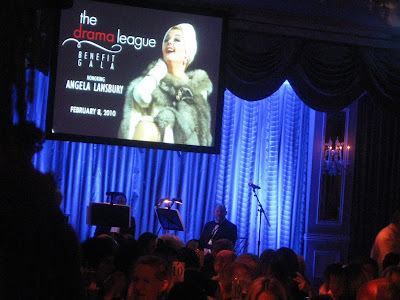 There was short film, which elicited much laughter and applause, compiled of many scenes from Angela's great film career and tv appearances, highlighting some of the greater and truly fabulous roles. It also included a hysterical homage to Murder, She Wrote that played out a full scene of her solving a murder that was compiled from many different episodes. Best of all, the film included clips from her Broadway career. 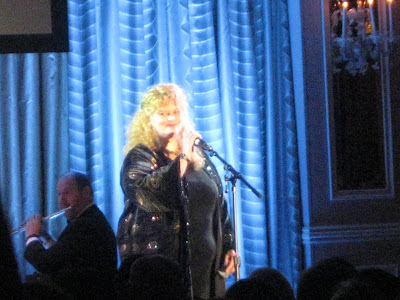 The concert itself lasted around an hour and featured songs from Angela's repertoire from both stage and film. 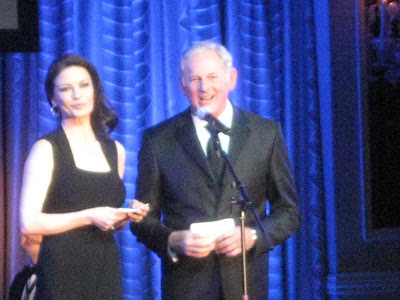 It was directed by Michael Mayer and Beatrice Terry. Choreography was by Diana Baffa-Brill and Joann M. Hunter. 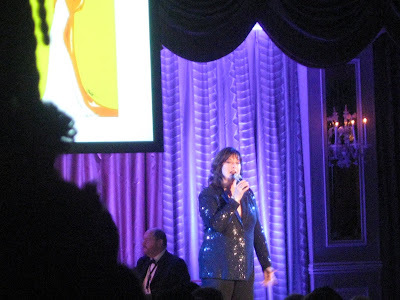 Each performer showed one thing in common - great admiration and love for the lady of the evening. 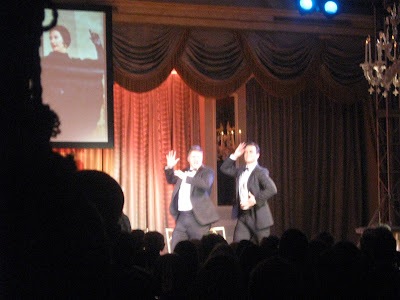 Clearly, Angela was having a great time and stood up for each performer while offering applause and blowing kisses. Thank you, Sarah, for such a detailed description of last night! And thank you for the little video of the interview with her! She looked lovely, as she never fails to, and I'm so glad I am able to say that I saw her live! Her career is illustrious and will never stop!!! Brava, brava! 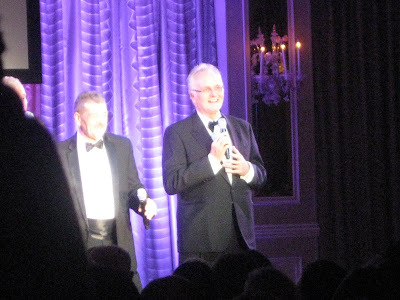 I'm glad you had such a marvelous night -- and that picture of DM waiting in the wings is divine. She has to be CHH -- it simply has to be! And another vote for Donna as the Mayoress Hoover Hooper! What a fabulous recurrence of events, Sarah. I have no doubt that you were, in deed, floating on the way home. I imagine it was magical. Some great photo shots as well. I agree with the others. That shot of Donna in the wings is so great! If anyone's dream in life has come true, it's yours, Sarah. What a magical, fabulous day and evening, and how thrilled I know you must be in your heart of hearts to have participated in your heroine's special time. 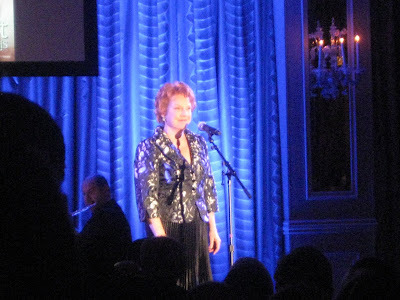 She is truly the Queen of Broadway, and you are truly the best observer ever of The Broadway Scene. Thanks for being you, and for being there!